The legendary Sunhouse Fountain frogs aren’t just the stuff of legend any longer. Built in 1926, the Sunhouse Fountain stands in the heart of Sequoyah Hills on Cherokee Boulevard at Talahi Drive. The circular wall of the fountain was originally ringed with a dozen bronze frogs spritzing water into the basin. No one is sure when the frogs disappeared from the structure, but they’ve been gone so long no one has reported remembering when they were there. Now, thanks to neighborhood residents, including retired University of Tennessee art professor Clark Stewart, the bronze amphibians are back and fully functioning. The fountain is part of Talahi Park, which is being renovated in stages. Stage one, the renovation of Papoose Park, was completed a couple of years ago. 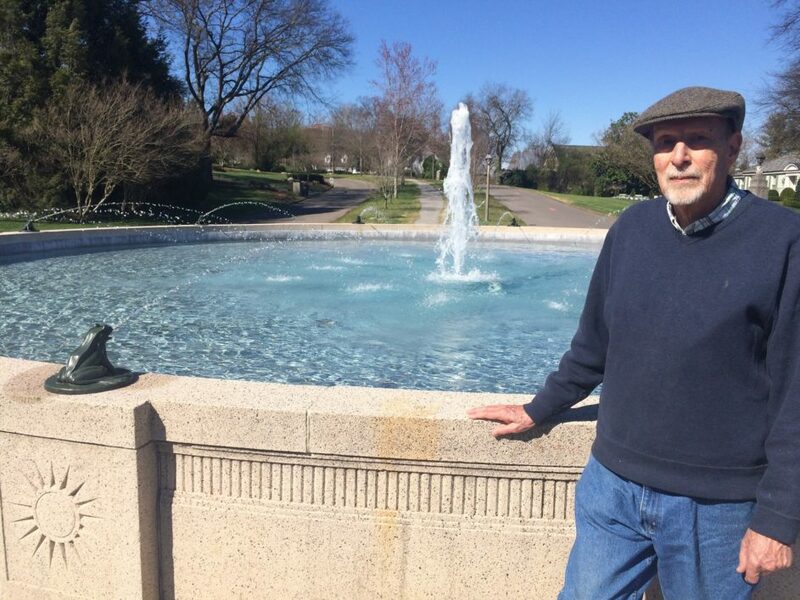 The Kingston Pike Sequoyah Hills Association received a $30,000 grant from the state of Tennessee toward the cost of renovating the fountain, and residents contributed another $50,000. Resident Melinda Ethier took on project leadership, and landscape architect Stephen Hackney volunteered his knowledge and vision. One big question was who would recreate the frogs and how. Clark and Judy Stewart were at a neighborhood meeting when the discussion arose. 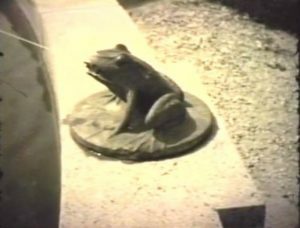 No one knew what the frogs had looked like in real life, and the only remaining image of them was a still from an old black-and-white home movie. For a couple of weeks, he studied the older image to figure out the posture and the approximate size of the frogs, matching them to the fountain for scale. “It wasn’t long after that that I figured out how to do it,” Stewart says. 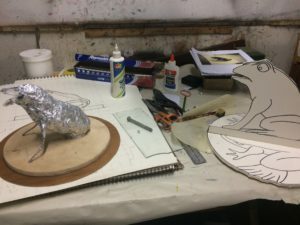 He began by making drawings, including pop-up drawings, then started wadding up tinfoil in the general shape of the frog. He added wire framing, then worked to create a form in Sculpey, a popular polymer clay material. This “positive,” as it is called, was used to create molds to cast the frogs in bronze. The Stewarts found Inferno Art Foundry in Union City, Ga., which used “lost wax casting” to forge the frogs. The Stewarts retrieved the finished frogs a few weeks ago. 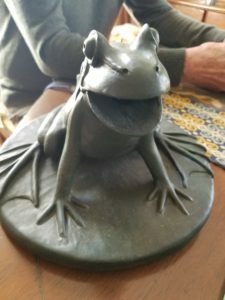 (The foundry created an extra frog for the artist, who donated his time.) Dennis Jessie Tile & Masonry completed the work on the fountain. Clark Stewart says the couple has a friend, now in his 80s, who grew up in the neighborhood who says that he doesn’t remember seeing the frogs. Stewart says, “My conjecture is that they were melted down in World War II,” because they’ve never shown up in antique stores or auctions, either. The Stewarts moved to Knoxville from California in 1966, after Clark completed his master of fine arts degree and joined the art department at UT. He taught studio art there and at Arrowmont School of Arts and Crafts and has exhibited his own drawings and paintings in more than 200 shows worldwide. He created “fantasy autos” and “fantasy boats” for well-received exhibits at The District Gallery in Bearden. He and Judy have lived in Sequoyah Hills for more than 30 years and take advantage of the neighborhood’s walkability with their big, friendly dog, Zoe. For the neighborhood association, the next part of the park restoration project is nearby Panther Fountain. Ethier says the Beautification & Preservation Committee will be revisiting estimates for the restoration shortly. 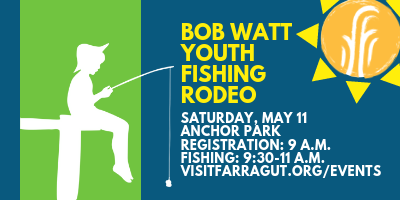 As always, volunteers are welcome.